Weave through the historic city center on a 4-hour evening walking and gastronomy route and enjoy a seamless blend of history, culture, and tapas. Devour the best of Spanish cuisine including the world’s top-rated black-hoof cured ham while discovering the fascinating story behind the city’s most emblematic monuments. 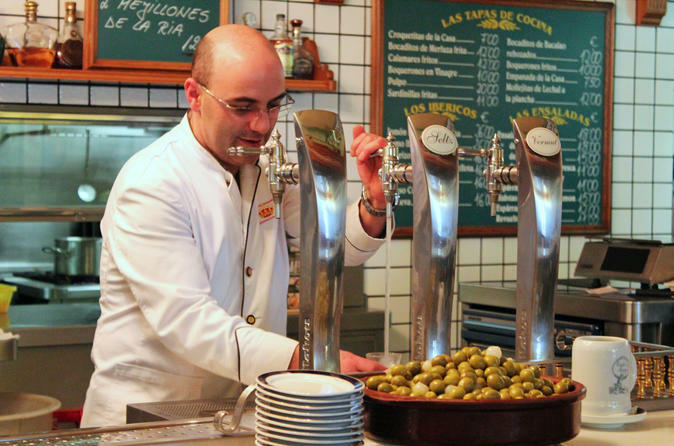 A 2-in-1 evening experience combining the most important aspects of any trip to Madrid: amazing local tapas and a fun, informative walking tour of Madrid’s historic city center, and a gourmet sit down dinner to finish the evening off! Includes all food and drinks, enough for a hearty dinner. Join your expert local guide in the city center before kick starting your 4 hour evening the Madrid way: with Iberian ham. Sip on vermouth and taste melt-in-your-mouth black-hoofed ham from the number one ham maker in the world while learning how to do tapas like a local. See how the battles of civilizations are still chiseled into the city’s streets and learn how a landlocked village grew into the capital of an empire. Duck into one of the most celebrated tapas bars in Spain and savor in tasty mushrooms stuffed with chorizo sausage, expertly grilled with the pizza of a hibachi master. Wash down the deliciousness with Spain’s favorite summer beverage prepared fresh to order. Fill not only your belly but also your mind and discover the exact point where Madrid was founded more than 1,500 years ago. Pop into a local beloved bar for wine and a few more delicious bites. To end the night with a bang, you’ll head to an incredible, unique tapas bar (which holds an amazing secret) to enjoy modern tapas (including the country’s finest cut of grilled pork) and sip wines, before rounding the evening off with a decadent dessert.